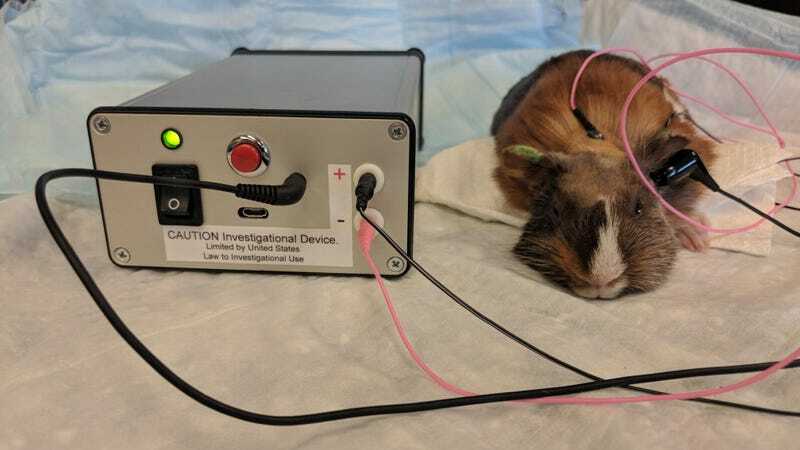 A device developed by researchers at the University of Michigan, seen above being tested on a guinea pig, might help treat people’s tinnitus. Photo: David Martel, Christopher Chang/University of Michigan. Millions of Americans suffer from a medical condition known as tinnitus, a disorder so tormenting that it makes Edgar Allen Poe’s talking, taunting raven sound charming. But the findings of a new study, published today in Science Translational Medicine, seem to offer something promising—a noninvasive treatment that attacks the root source of tinnitus while making life noticeably easier for its sufferers. People with tinnitus are plagued by phantom noises, usually ringing or buzzing, sometimes to the point where they can no longer work or function. Worse still, cases are often chronic and incurable: Current treatments include cognitive behavioral therapy to help people manage the distress it causes, using actual sounds to mask the ringing, or invasive brain surgery that often doesn’t work. But researchers at the University of Michigan believe they’ve figured out how to short-circuit the complex neurological process that results in tinnitus. One of the leading theories behind what causes most cases of chronic tinnitus is that it begins with misfiring neurons in the dorsal cochlear nucleus—one of the two regions of the brainstem where auditory information is first processed. These neurons, called fusiform cells, are meant to fire when the brain receives input from the outside world, which is one of the first links in an almost simultaneous chain of events that leads to us correctly “hearing” the sound something makes. In people with tinnitus, this synchrony is thrown off-kilter and the fusiform cells fire whenever they please, leading to people hearing sounds that aren’t there. This initial imbalance can be caused by anything from damaging loud noises to ear infections, it’s thought, and often accompanies hearing loss. The University of Michigan team, based on research they had done with guinea pigs, created (and patented) a device they think can retrain the brain circuitry involved in causing at least some cases of tinnitus. “We worked out in animal studies that specific combinations of sound and pulses could either increase or decrease the activity of these [fusiform] cells that activate the rest of the brain,” senior author Susan Shore of the university’s Kresge Hearing Research Institute told Gizmodo in an email. Their device, via headphones and electrodes placed on the person’s neck and head, sends out bursts of sounds and mild electrical pulses that alternate with one another. This theoretically resets the fusiform cells and decreases how often and severely a person’s tinnitus should happen. After successful animal experiments, the researchers recruited 20 volunteers with tinnitus to take part in a 16-week experiment where they would take home and use a device every day. Half of the volunteers used the sounds-and-shocks device daily for four weeks, took a four-week break, and then used a similar device that only emitted sounds, but no shocks, for another four weeks, and finally took another four-week break. The other half did the same schedule of four weeks on followed by four weeks off, but they instead started with the sounds-only device, and then moved on to the sounds-and-shocks device. During the weeks the volunteers were using the real device (the one that emitted both sounds and shocks), they reported less noisy and high-pitched episodes of tinnitus along with fewer episodes overall—two even said their tinnitus went fully away. That predictably led to a better quality of life and reduced stress for the volunteers. Wonderful as an noninvasive and practically risk-free device (unless you can’t stand mild shocks) to treat tinnitus could be, it might not come without its limitations. The subjects’ tinnitus largely returned a week after they stopped using the device, even for the two people who reported losing it completely. The researchers also only used volunteers with a particular form of tinnitus. These sufferers are able to soften their episodes by applying pressure to their head or clenching their jaw—a rudimentary version of keeping their fusiform cells in check, it’s thought. That could mean the device won’t work for the 20 percent to 40 percent of tinnitus sufferers without that particular quirk. The device’s effects did seem to accumulate the more it was used, Shore said, suggesting that a longer course could provide longer-term relief. “This treatment is only 30 minutes a day, so even if people had to use it every day or once a week, it would be helpful,” she added. The team next plans to test out their device with a much larger group of people. This new study is already recruiting volunteers and is set to start in April. Researchers elsewhere are exploring a similar “bi-modal stimulation” approach to treating tinnitus. If this work continues to pay off, these devices could be a game-changer. It’s estimated that at least 15 percent of Americans, or 50 million people, suffer from tinnitus, while two million have a severe or debilitating case of it. Update: Those interested in learning more about the team’s new trial can email them at tinn.trial@umich.edu.